The Liquor Control Board of Ontario (LCBO) is responsible for the importation and distribution of booze in this Canadian province. Americans can buy their liquor at grocery stores and convenience stores, but in most Canadian provinces this is not the case. With the exception of Quebec, each province regulates the sale of booze by selling it in specific, licensed locations. In Ontario, that is the LCBO, which owns and operates thousands of liquor stores across the province. They are beautiful stores, stocked with wines, spirits and ales from across Canada and around the world, staffed by knowledgable experts who can help suggest the perfect pairing. Each season, the LCBO issues a free magazine called Food & Drink to its stores. It is a beautiful, full-colour publication filled with original recipes for cocktails, suggestions for wine pairings and excellent food recipes as well. 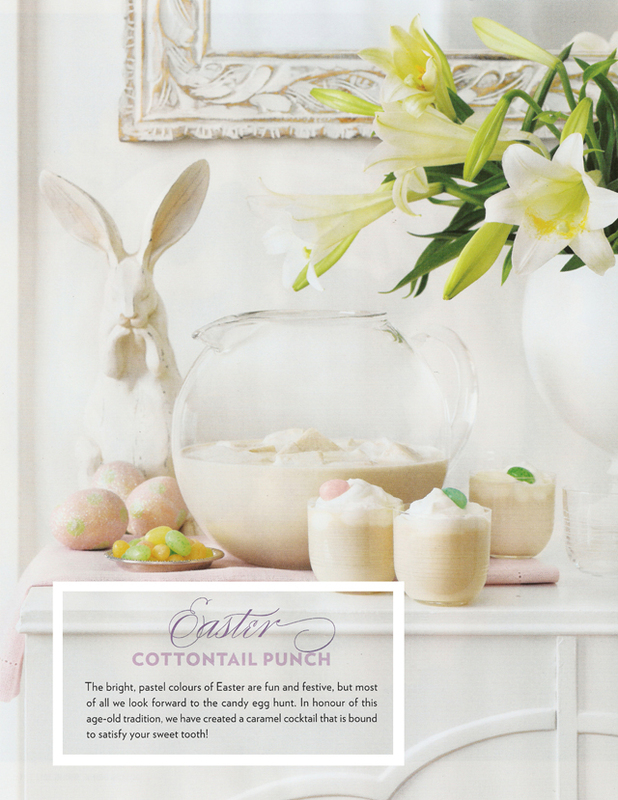 It offers decorating tips for holiday tables and is one of the best giveaway publications I have ever seen. 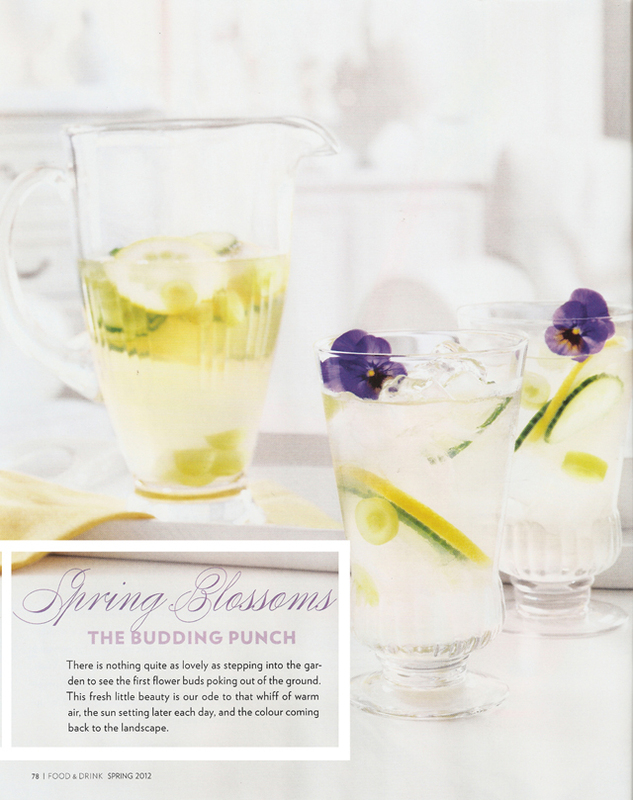 In its current issue, there is a wonderful feature on spring punches that I wanted to share with you. I intend on trying each one of these this season! I hope you do too! Each recipe makes approximately eight drinks. To a punch bowl or large pitcher, add 1 cup raspberry vodka, half a cup of Alizé Red Passion Liqueur, 1 can frozen concentrated lemonade, 3 cups water and 1 cup soda water. Add 1 cup of fresh raspberries, 1 cup of red currants (or sliced cherries), 1 lemon sliced in wheels, 2 limes sliced in wheels. 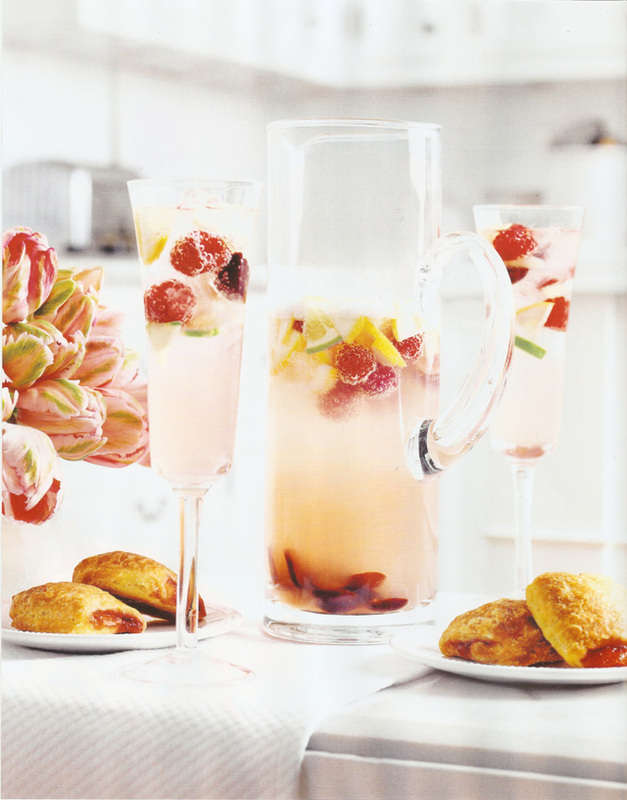 Pour into tall glasses with ice, evenly distributing the fruit. To a punch bowl or large pitcher, add 1 cup of Smirnoff Twisted White Grape vodka, half a cup of Chase Elderflower Liqueur, half a cup of Sauvignon Blanc, 1/4 cup fresh lemon juice and 3 cups of white cranberry juice. Add 2 lemons sliced in wheels, 1 cup sliced green seedless grapes and 1 English cucumber sliced into thin rounds. Pour into glasses, distributing fruit evenly. For serving you can add an edible flower to each glass. 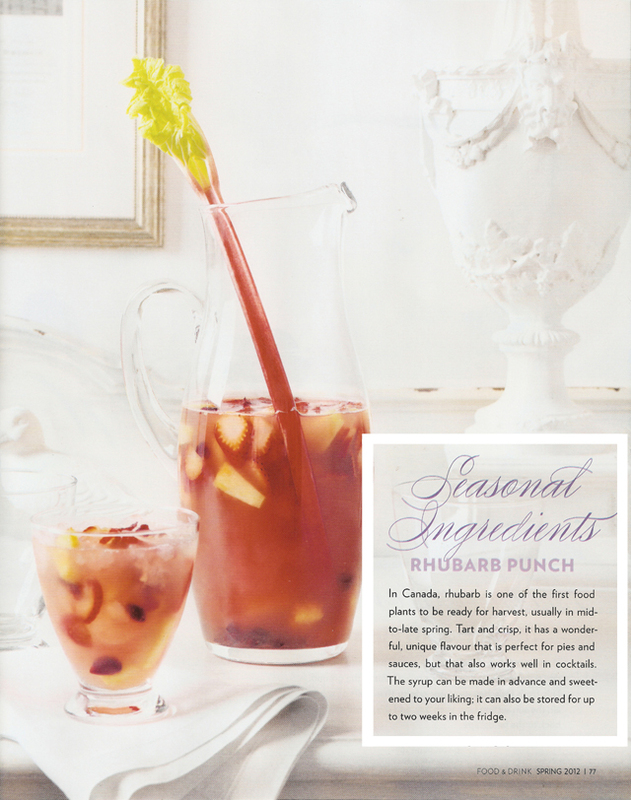 To a punch bowl or large pitcher, add 1 cup rhubarb ginger syrup (recipe follows) one-and-a-half cups of spiced rum, half a cup of lime juice, two cups pineapple juice and two cups cranberry juice. Add two cups of strawberries, sliced, one cup chopped pineapple and one cup dried cranberries. Pour into glasses with ice, distributing fruit evenly. RHUBARB GINGER SYRUP: Clean and chop 4 cups rhubarb and place a pot with two cups of water. Simmer for 10 to 15 minutes. Add 1 cup sugar and one teaspoon of fresh ginger. Continue to simmer until rhubarb is soft. Strain out liquid. Let cool, cover and refrigerate. 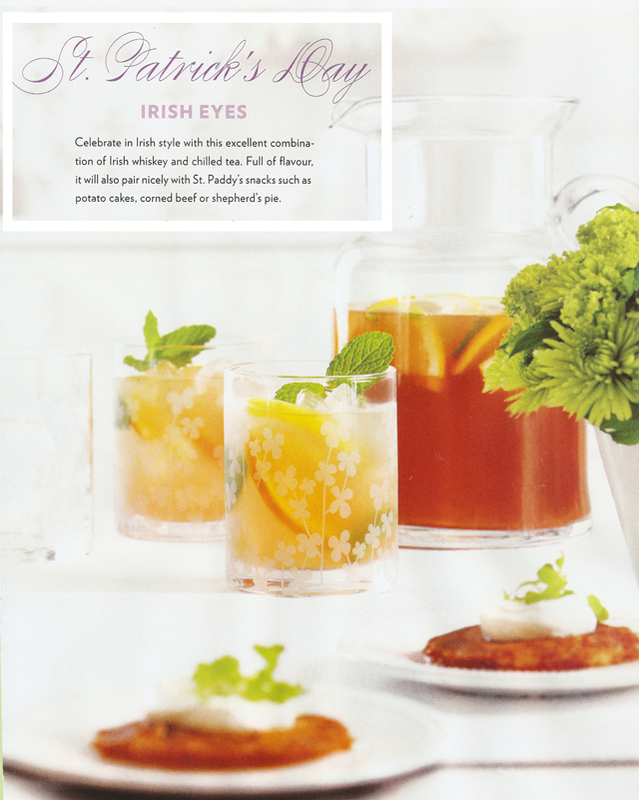 To a punch bowl or large pitcher, add 1 cup Irish whiskey, half a cup of Cointreau, half a cup of McGuinness Cherry Brandy, half a cup of fresh lemon juice, one cup fresh (cloudy) apple juice and 2 cups chilled orange pekoe tea. Add two lemons sliced into wheels, 2 oranges sliced into wheels, and 20 fresh mint leaves. Pour into glasses with ice, distributing fruit evenly, and garnish each with a sprig of mint. 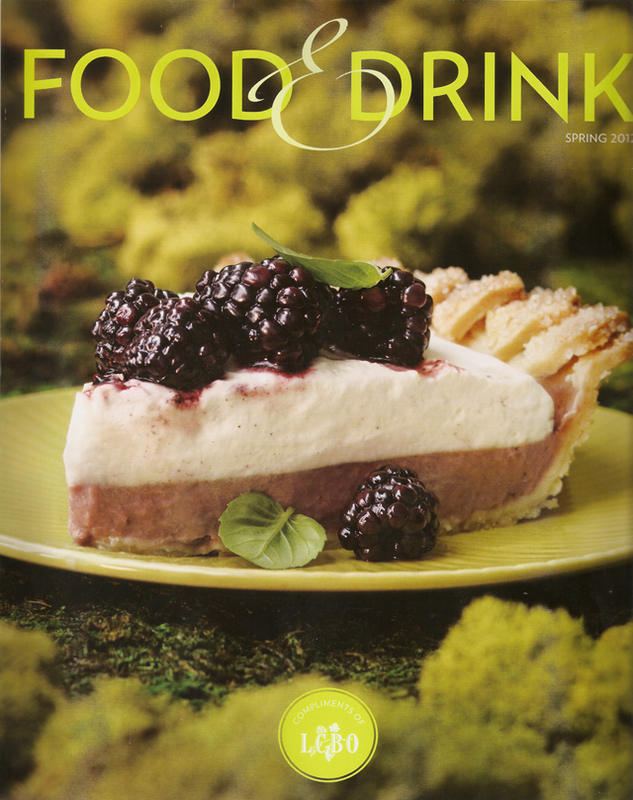 The cover of the Spring 2012 issue of Food & Drink, a glossy, full-colour magazine published by the LCBO and distributed free, in-store, to its customers. This is an LCBO location not far from where I live. It's always a pleasure visiting their stores: big, bright and beautiful with an incredible selection. What a great little giveaway magazine. I will certainly be using the recipes you have shown. They all look great. Over here you can buy alcohol in many, many shops but I like the idea of special stores like you have. Those spring punches would definitely drive you crazy.